Help the MHF with a new project for Haringey Men. 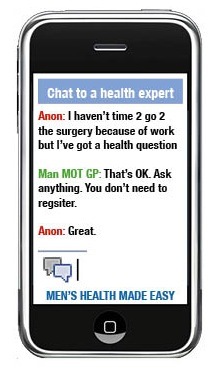 The MHF is running a new project in partnership with Haringey Council, the Tottenham Hotspur Foundation and others to provide an online health advice service designed by and for men in the borough. It’s a great idea but to make it work best for the blokes in the borough we need your help. check out some of our ideas and tell us what you think. If you'd like to do any or all of these, contact us. Jim Pollard is managing the project for the Men's Health Forum. Jim's a health journalist, editor of the MHF websites including malehealth and author of several health books including the acclaimed User's Guide to the Male Body. Few know health in Haringey as well as Dr Vanessa Bogle who is leading the research side of the project. Since 2005, she's been Senior Public Health Commissioning Strategist for the London Borough of Haringey. She is a Visiting Lecturer on various MSc Health Psychology programmes and is a research supervisor on the MSc and Doctorate Health Psychology programmes at City University. The team is completed by Peter Tickle. Also well-known in Haringey, Peter is the Health & Wellbeing Senior Development Officer at the Tottenham Hotspur Foundation from which he is seconded. He's been key in delivering health checks and the club's other programmes in the community and also coaches Spurs Ladies team. What have you produced so far?